I have wanted to get my oldest son a train table for a couple years, but have been unable to because we are short on space. This was until a sale at ToysRUs in December motivated me to purge our toy collection and make room for something new. Imaginarium’s Classic Train table has been a staple with many of my friends and had been recommended to me by all of them. It appealed to me because it comes with everything, leaving no guess work as to what would be needed to fill the table for an afternoon of fun. Out of the box I was concerned that the table wasn’t going to live up to the high expectations I had for it. Before we bought the table we did a lot of research and read quite a few reviews. While many said that the table didn’t go together properly or that the instructions weren’t very good, we didn’t have any issues with the installation. 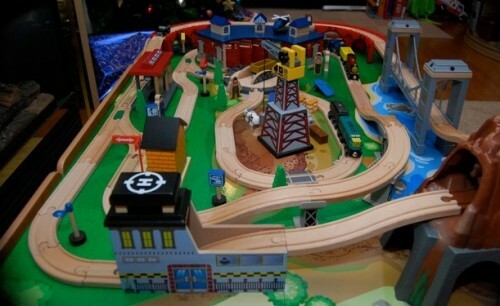 We put it together on Christmas Eve, with my husband constructing the table and me assembling the train tracks. It took about 2.5 hours but it was worth it when we saw the finished product. Once assembled I have to say I was impressed. The table was secure and everything went together easily as per the directions that were included. The set came with that we would need for a good couple hours of play including 1 helicopter, 1 truck, 1 car, 8 train cars and 12 pieces of cargo. It has lots of elevation changes, train sounds when you ride over certain areas of the tracks and a cool roundhouse to store your trains when they are not in use. 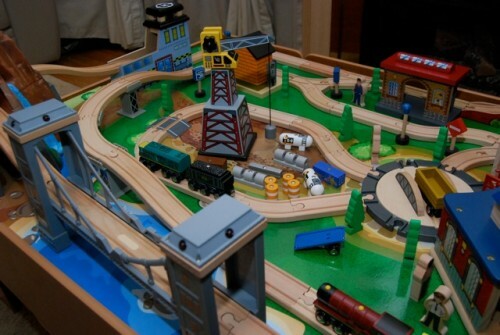 Plus, it has 2 drawers to store extra track, trains or accessories if you chose to add to your set. When the boys woke up on Christmas morning they were just as excited as we were. They immediately found a side and started to play TOGETHER. And because there are so many trains and attachments, there were no fights over who had what. I highly recommend Imaginarium’s Classic Train table for kids 3 and over. It offers many imaginative play opportunities and allows your child to create their own play world.